Nuts about NAT | Out of the box. Unlike actual mailing or house addresses, public IP addresses is more easily depleted. Each host in a computer network or Internet in this case, requires public IP address to identify itself in the Internet. IP Simplified : It is used as a unique Identity for computers to communicate and interact in the Internet. This is where NAT comes into play. 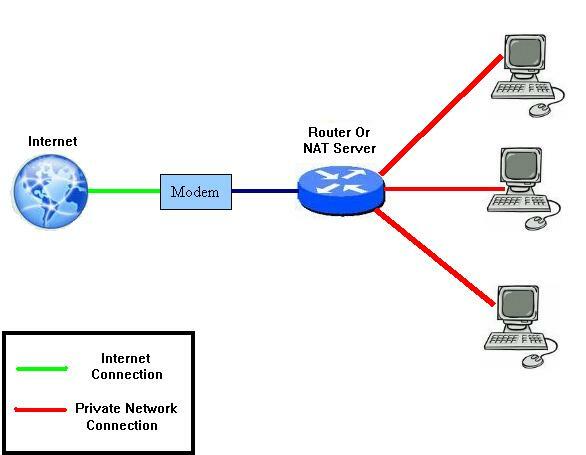 NAT abbreviation of Network Address Translation is a simple technology where multiple computer in a private network shares 1 single connection to the Internet simultaneously. One must take note that the private IP address used in private network will not affect the Internet public IP addresses. It is due to the computers and servers located in the internet unable to view the private network computers. In short, private network computers hide behind the NAT server. The NAT server will act as a translator in between the Internet and the private network. As you have guess, NAT server is your router in your private network. If you are using Internet Connection Sharing, the computer or the server is also a NAT server. With implementation of NAT, users can share their internet connection with multiple PC while conserving public IP addresses. This entry was posted in Information Technology, Network and tagged internet, NAT, Network by KarMeng. Bookmark the permalink.